It was a picture-perfect day, a perfect day for a drive in the country, as my parents would say. Indeed, the sky was brilliantly blue, the sun was a shimmering gold, and there was a cool fall crispness in the air— yes, a day requiring a sweatshirt or light jacket for early autumn and early-morning comfort. In spite of all of this typical October character, this was to be no ordinary drive in the country. Rather, this was Second Chances Garage’s Second Annual Road Rally, a fundraiser (and truly fun event) providing drivers and passengers the opportunity to travel through some 50 miles of Frederick County’s gorgeous autumn landscape, while striving to respond to a similar number of questions, based on careful observations, contained in a booklet guiding us along the colorful route. ! ! sofa on a house’s front porch), and historic landmarks in order to complete our question responses, all the while enjoying the opportunity to partake of good old-time conversation, sightseeing, and laughter … and all without the usual distraction of ambient radio or CD music, email, and texting. ! ! Having managed the course, we eventually regrouped just after noon for a lovely, filling, and altogether satisfying luncheon at the Barbara Fritchie Restaurant (replete with enormous freshly baked slices of pie), where participants and event sponsors were feted, awards presented, and door prizes distributed. Not only was this a great and fitting fundraising event for Second Chances Garage, but it was also a reminder of and a nostalgic return to earlier and perhaps more fulfilling and enriching weekend days, ones that consisted of long drives in the countryside, captivating car talk, eyes turned to spectacular outdoor vistas (rather than focused on electronic devices), and camaraderie amongst car enthusiasts and fans of the local environment. 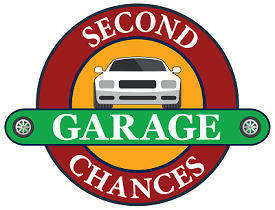 It was a day to remember and both a memory and an experience for others to enjoy next year, when another Road Rally winds its way through Frederick County and brings back another bit of nostalgia to all of us who call Frederick home and who support the work of Second Chances Garage.